A safe environment for women seems like an anomaly on the Internet these days, but at The Mary Sue, the community of readers is showing us how it’s done. One of those readers is JustPlainSomething, a regular commenter who geeks out about nerd culture with a healthy dose of comics, movies, television, and games. An unabashed feminist, she is representative of the type of inclusive environment for women that The Mary Sue cultivates every day. She also deserves serious Internet points when one of her comments spontaneously sparked a meme that the TMS community quickly adopted with fervent enthusiasm. More on that later. Serendipitous moments like these are what make JustPlainSomething a special addition to the community and why I’m so excited to share her interview with you today. So check out what she had to say about commenting and I’m confident that you’ll find your next friend on the Internet. Q: How did you end up writing for The Mary Sue? Well, I’ve been blogging and then vlogging on my own website Just Plain Something since 2009 and I’ve been a reviewer for CliqueClack since 2011. As a reader, The Mary Sue has been one of my go-to pop culture websites specifically because it caters to nerdy women with a solid feminist leaning and that’s pretty much my schtick. Once I started commenting regularly maybe a year ago, I quickly connected with the regular group of commenters and felt like a part of the community on the site. So earlier this year when TMS put out a call for contributors, it just made sense to apply. I wanted to add to that voice. I’d say it has more to do with the community than with the stories themselves. Don’t get me wrong – giving readers good content in both news posts and opinion pieces is important, but I’ve been to tons of websites where the article I’ve read was insightful but any decent discussion was buried under dozens of comments that we think of when we think of the stereotypical internet comment. The Mary Sue has very diligent moderators and a consistently enforced set of comment section guidelines (trolls do get banned), but luckily the general community of commenters the site has built up tends to bring great discussion and debate to the table. Even an article about the basic movie casting rumors or a clip from a TV show season premiere can spark great discussions. And thoughtful writing leads to thoughtful discussions as well. I wrote a very personal piece this month about my own childhood experiences with nerd gatekeeping and I was very worried about the reaction it would get considering the online climate this year around women talking about sexism in nerd culture. 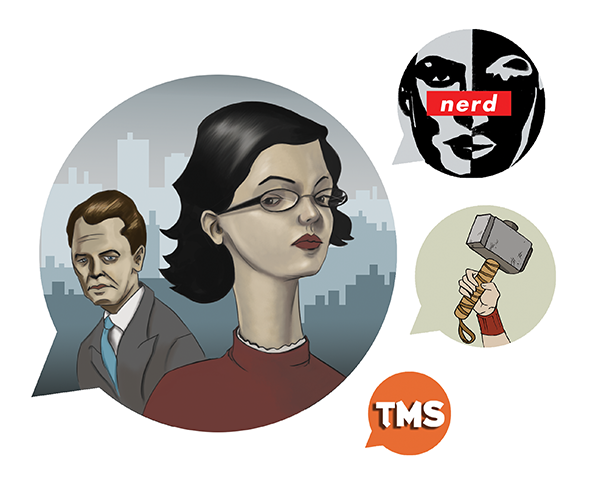 However, the large, large majority of comments I received were not only supportive of the piece but included other women’s stories of sexism in nerd circles, some of which were strikingly similar to mine. I ended up being so glad I wrote the piece as openly as I did not only because I could help other people put into words frustrations they had had growing up, but also open discussion in the comments for others to share their experience with each other. The comment got up-voted hundreds of times, received a ton of comments about what he’d be like with this new name and thus, Snortblat became a thing. The Mary Sue community has started using the name in the comments even when talking about movie Thor, occasionally the actual Mary Sue articles refer to him that way and there’s a fancomic (which I’m helping with as creative consultant because this is the world I live in). There is a good chance that naming Snortblat will be my legacy. There is a good chance that naming Snortblat will be my legacy. As far as being a commenter goes, I try not to overthink the causal comments. The Snortblat comment was posted pretty much as the first thing that came to my head. However, if I’m debating with a person or if it’s a serious issue, I do try to reread my comment a couple times. And if it’s a particularly heated debate, I’ve been known to make myself step away from the webpage for a few minutes to make sure I can clear my thoughts and not say something while I’m on edge. But mostly it’s about rereading the comment, making sure that there isn’t ambiguity in what I’m trying to say, before I post it. I chose JustPlainSomething because it’s the name of my blog (which in turn I took from a line of dialogue from the movie Rope) and my avatar is a picture that artist Luke McKay drew of me many years ago. Q: What was the last comment you read that made you laugh? There’s a good chance this is only funny to me, but in a TMS post about Denise Dorman’s ongoing thoughts on what she felt is wrong with modern comic conventions, someone posted a quote from Grandpa Simpson not getting youth culture and other commenters (including myself) added other Abe Simpson lines. Perhaps not the wittiest of content from the community, but that had been a particularly frustrating day for me and getting to share some silly Abe Simpson quotes had me giggling.